Laurel and Hardywood is pleased to announce actress Joan Del Mar will attend this July’s convention. Joan was 6 1/2 years old when she started in show business. At the age of 8, she appeared as the football game timekeeper in the Laurel and Hardy film “Nothing But Trouble.” She remembers the fun she had on that two-day shoot. At age 11, Joan joined the American Federation of Radio Artists (AFRA) and enjoyed a career in radio appearing on “The Jack Benny Show.” She left the business to get married and raise two sons and then rejoined the profession she loved in 1993. Although Joan and her family have attended Way Out West Tent meetings and banquets over the years, this is her first convention appearance! “The Woim” will attend his second Sons of the Desert Convention when he appears at Laurel and Hardywood. 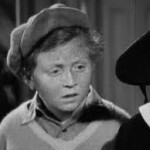 Child actor Sid Kibrick, who was Butch’s sidekick, “Woim,” will join the fun for the Our Gang Reunion on the Fourth of July. He and his older brother, Leonard (who passed away in 1993) were cast as heavies in the series. 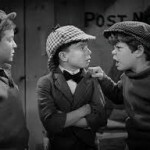 As one of the most recognizable members of the Little Rascals, Sid was in 26 of the films including the Oscar-winning short, “Bored of Education,” along with “Glove Taps,” “Rushin’ Ballet” and “Pigskin Palooka.” He also appeared in the classic, “Dead End,” with Joel McCrea and Humphrey Bogart. We are absolutely thrilled that Sid will be among the guests for what is shaping up to be the biggest reunion of Little Rascals in years!